Modigt og provokerende udfordrer SAPIENS alt det, vi troede, vi vidste om at vaere menneske: vores overbevisninger, vores handlinger, vores magt og vores fremtid. Men som indsigtsfuld flyvetur gennem menneskets enestående historie fører han laeserne op på et højere plan, end nogen anden forfatter har vovet. I had to force myself to finish it, as it is filled with common knowledge and not written in the way I personally find enjoyable to listen to. The early human history part was mostly made of something one can probably remember from the history lessons in school, as well as some parts that you can find in a much better written modern classic "Guns, Germs and Steel". There were a few good references to ancient Mesopotamia and king Hammurabi, but I would rather read a dedicated book on that subject. Parts about economy, physics, biology and psychology - are very shallow and I feel like I've learned practically nothing new. Stylistically - the book is filled authors conclusions and thoughts on different things, presented as facts, and without the reasoning as why the author jumped into those conclusions. For the danish audible users: Oplæseren gør det godt, der er dog nogle får ord som Versace, Cyborg mm. der bliver udtalt lidt forkert. men det gør ikke bogen dårligere kun de få sekunder man skal lytte til det ord. 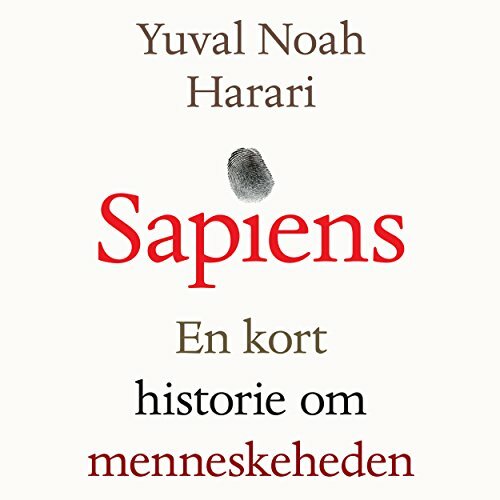 It's an amazing book, that really makes you think I've already bought the next "Homo Deus" I would recommend that you split up the listening sessions.